Newcastle Audi – The cathedral of quattro? 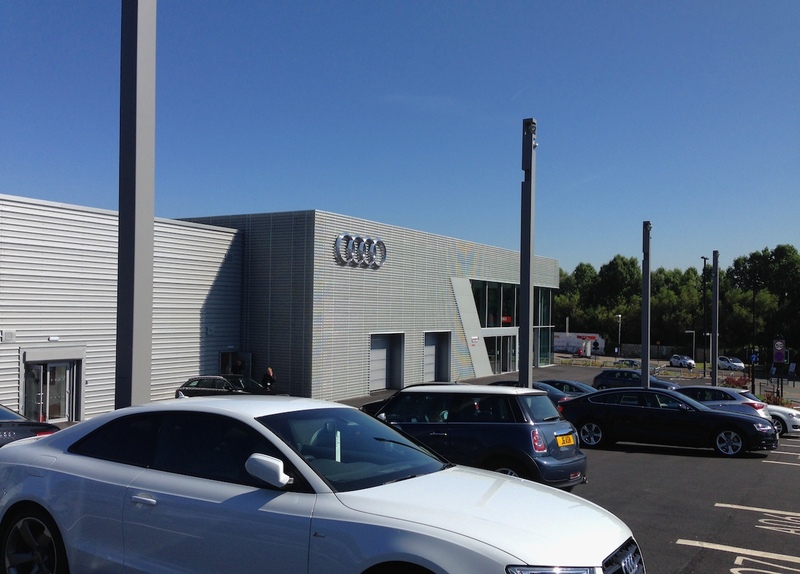 Newcastle Audi recently opened a brand-new dealership on Scotswood road in the city. EngageSportMode was in the area, so we went along to take a look around. It’s not often a car dealership has the ability to leave you a little bit speechless; unless you’ve just been given the price for your car in part-exchange perhaps. But Newcastle Audi’s new site left ESM just staggered at the sheer scale and majesty of the new operation. Used car section can hold up to 80 models. Whilst out looking at family cars for ESM’s BTCC Correspondent, we couldn’t resist taking a snoop around. We weren’t disappointed; the 4.5 acre site is vast, with the main showroom covering 35,000 sq ft by itself. Covered in an impressive metallic mesh, with angled swathes of glass, even from the outside it’s an impressive building. 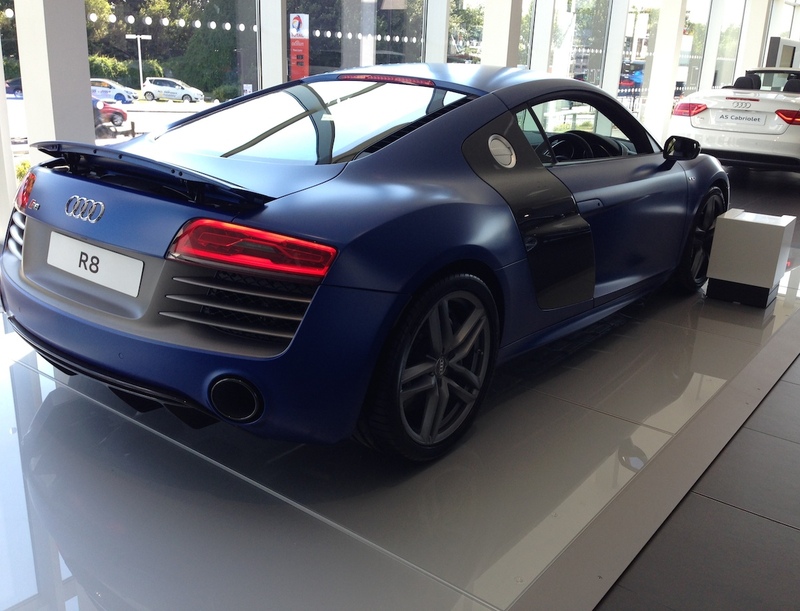 R8 V10 Plus – Matt Sepang Blue paintwork costs £3,750 alone! Internally, it’s like nothing we’ve ever seen when it comes to selling cars. There’s space for 19 new models inside, pleasingly arranged in order of model name / size, set amongst curved walls, black granite and funky mezzanine levels. One of the staff described it as being like an airport terminal; quite frankly it puts most airports to shame. To roll out the clichés, it looks more like the hideout of a James Bond villain than somewhere trying to sell you a car. Key highlights were the stunning matte Sepang Blue R8 V10 Plus (pictured), an RS5 coupé and EngageSportMode favourite; the S1 quattro. Newcastle Audi also has specialist Configurator rooms to help customers make that difficult decision as to which shade of white (or other colour!) to spec’ their new car in – the first time this technology has been used outside of London. The used car area outside also manages to impress; with space for eighty of Ingolstadt’s finest to be browsed, under the watchful eye of an all-seeing glass cube. Frankly if the main building is the airport terminal, this is its control tower. But we bet there can’t be many control towers that house an original Audi Quattro in their base! Brought in especially to reflect the marque’s heritage, this original low-mileage Quattro was in stunning condition. Even more amazing was that thanks to a fastidious previous owner, the car was in such a good state in didn’t need restoring or reconditioning before going on show. Even the Ronal alloy wheels were unrefurbished from new. Wow. Most famous arches in motoring? We can also safely say it was just as big a time-warp on the inside and that, despite the years, it started without fail to produce that wonderful five-cylinder sound first time. All the staff we spoke to were incredibly friendly and helpful, with no qualms about us being there just to check out the new building. 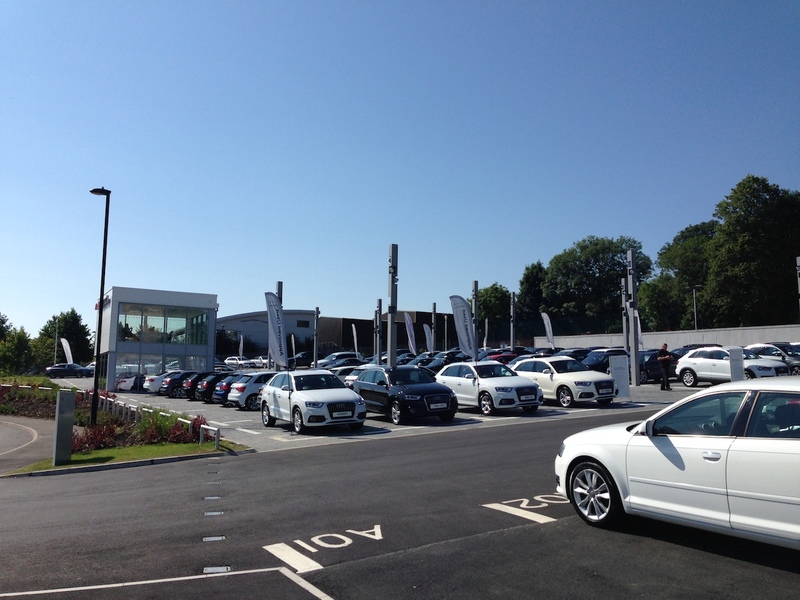 But, we suppose, not every dealership is quite as stunning as Newcastle Audi’s! It seems hard to comprehend a dealership of such size anywhere, but it’s even more encouraging to see it here in the North East. This new dealership stands as a testament to the meteoric rise of the Audi brand over the last decade, both locally and globally. The fact we almost sound indoctrinated by this new dealership is strength as to just how impressed we were by the experience. It’s something you need to see for yourself, so checkout the Newcastle Audi website here should you want more details.